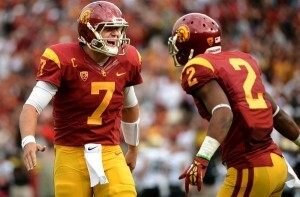 History was made at the Coliseum in USC’s 50-6 beatdown on Colorado. Matt Barkley set a Pac-12 career touchdown passing record (102 TDs and counting), Robert Woods set a school record in career receptions and surpassed Dwayne Jarrett’s previously held record at 216, among other personal and school bests set by Barkley and Woods. The Trojans, at 6-1, are officially bowl eligible. While expectations for USC are always higher than just bowl eligibility, it is a nice milestone to reach having not played in bowl games the past two years.